Cygne/SDL is the Simple Directmedia Layer (or SDL) port of the Windows version of Cygne, a free and now OpenSource (since 12-03-2002) Bandai Wonderswan Color handheld software based emulator. The Bandai Wonderswan Color is a nifty handheld device with features similar to Nintendo's Gameboy Advance handheld. The main problem only is that the Bandai Wonderswan Color was (and still is) released only in Japan, thus most games are for the Japanses consumers while some of them are for foreign (read : outside of Japan) consumers to. 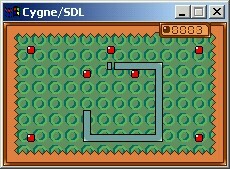 The goal of Cygne/SDL is to produce a portable version of the Cygne emulator using the SDL library for graphics, keyhandling, joystick support, etc. Cygne/SDL uses ROM images to play those wonderfull Bandai Wonderswan Color games, see the topic "What are ROM images?" for more information about this topic. Cygne/SDL uses the sources (allthough a bit modified) from the Cygne 2.1a WIN32 version as well as the NEC CPU core from the MAME project (released under the MAME license) which is available from the official Cygne website. Cygne/SDL is released as OpenSource under the GPL license which means you may hack and use the code from Cygne/SDL if you send your contributions to the Cygne/SDL project and give is some curtosy as well. The Simple Directmedia Layer (or SDL for short) is a library designed for multimedia applications and gives us multimedia API's and more! Windows users should be familiar with Microsoft's DirectX, well SDL is kind of an OpenSource variant but then usuable for many platforms (BeOS, FreeBSD, Linux, Sun Solaris, etc to name a few) which means that most code written with SDL is cross-platform. SDL is for use with Cygne/SDL as our main graphical and keyhandling library which allows us to port Cygne to various platform. Currently BeOS, UN*X clones and WIN32 version compiles out of the box without modifications done to the source. For more information about SDL, see the official SDL website. 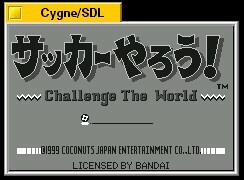 As stated before, Cygne/SDL (and Cygne) is a software based Bandai Wonderswan Color handheld emulator. To allow you playing games on Cygne/SDL it requires a binary dump of the original gamecartrdidge designed for this handheld device. These binary dumps are called ROM images or ROM's. These binary dumps are widely available as .wsc and/or .ws format and mostly zipped (.ZIP extension). All these binary dumps can be used with Cygne/SDL. Beware, in most countries you may use these binary dumps only (but only!) if you own the original cartridge itself. The use of binary dumps without owning the original cartridge or without approval from Bandai is a act of piracy. In most countries this is an act of copyright violation and could result in punishment. So please only use images if you own the original cartridge, if you do not you hurt the game-industry as well as this project and other emulation projects as well! First, don't e-mail use with questions like where to get these images! We are against piracy and there for these questions will NOT be anwsered! - ZIP and GZIP compressed ROM images supported. Uncompress the files and read the documents in the source distribution. If you have binary distributions available, feel free to e-mail us at sdlemu@ngemu.com with the link and the Operating System it was compiled on! If you should have contributions (like code changes, makefiles for different OS', etc) please e-mail them to sdlemu@ngemu.com. You'll be given full credit and the changes will be integrated in CVS as soon everything is tested. - Dox, the original author of Cygne WIN, for releasing the source to the public. Wonderswan color is © by Bandai, Cygne is © by Dox, Cygne/SDL is © by SDLemu team. All rights reserved.